There is a tightrope that has to be walked when writing a great love song. How do you avoid the cliches that so easily ensnare and bog such a song down in an endless, cheesy mire? Sometimes the genre is transcended and something very intimate and beautiful is communicated in a way that seems brand new; a good example is Peter Gabriel’s In Your Eyes. A lot of other songs serve as well intended but poorly executed disasters that only serve as a warning to anyone who would dare venture into such emotive waters. It seems that a good soul singer is able to avoid the whole issue entirely. If you listen to Al Green sing Let’s Stay Together or Otis Redding’s Try a Little Tenderness you are not hearing anything overly profound. I mean, let’s be honest, lyrically they are pretty childlike and simple songs. There is something in the delivery though, something primal, candid, and vulnerable that bypasses the cognitive and goes straight to the heart. 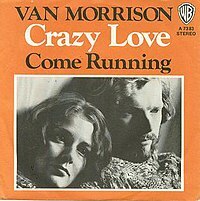 As a purveyor of white Irish soul Van Morrison shows us exactly how it is done in Crazy Love. Like a lover impatient to say what’s on his mind Van intones, “I can hear her heart beat for a thousand miles” even before the instruments are ready it would seem. As he continues to expound on his lovers virtues (the object of Crazy Love was his new wife Janet Planet) he is backed up by the most gorgeous gospel backing singers. One of those backing singers, for trivia’s sake, is Emily (or Cissy) Houston; mother of Whitney Houston. In Shakespeare’s Hamlet Lord Polonius declares that, “Brevity is the soul of wit.” And in keeping with such sage advise Crazy Love has a running time of well under three minutes leaving the listener wanting more and ready to listen again and again. Maybe this is what helped WXPN listeners vote Crazy Love #198 in their 885 All Time Greatest Songs list. This entry was posted on September 28, 2009 at 7:00 am and is filed under Cissy Houston, Crazy Love, Uncategorized, Van Morrison. You can follow any responses to this entry through the RSS 2.0 feed. You can leave a response, or trackback from your own site.